25-Oct-2009 -- Degree confluence 29ºE 137ºS is situated on Lake Eyre (Nth), fortunately only 550 metres from the shore line, in an area called Belt Bay. The nearest road is the famed Oodnadatta Track which is 43 kilometres away. The Oodnadatta Track crosses many pastoral holdings. To get to the confluence, we had to leave the track and venture “bush”. I wish to thank the manager of Anna Creek Station, (the World’s largest working cattle station) and the manager of Stuart Creek Station for allowing us to use their tracks and cross country to get to the confluence. Without their approval we could not have “got there”. Again thanks for their support. 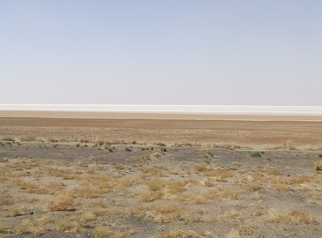 Lake Eyre is for most of the time, a large dry salt lake and is Australia’s and the World’s largest salt lake. The lake at its lowest is -15 metres below sea level (the lowest point in Australia). Lake Eyre is actually two separate depressions. Lake Eyre North is 8,430 square km in size as compared to Lake Eyre South which is 1,260 sq km. Total 9,690 sq km. The lake has only filled to capacity 3 times in the last 150 years. On average, water flows into the lake every 8-10 years. This year the north of the lake filled and we were unsure as to how far south the water had travelled. More particularly, was the surface hard enough for us to walk out to the confluence. Breaking the surface can expose thick, deep, stagnant mud that is not that kind to human skin. Our preference is a surface that can support us without too much trouble. We did take timber panelling and tools so that if necessary, we could manufacture some “snow shoe” style buoyancy. The tools stayed in the tool box. My team and I live in Adelaide, South Australia. The confluence is approx 870 kilometres from my home. Due to the remoteness of this confluence we needed at least 2 vehicles (we took 3). This point is a long way from any facilities and medical help. We had to be self sufficient in every way. Six of us got together to attempt and succeeded in reaching degree confluence 29ºE 137ºS. The team: Phil Bigg, my brother Ivan, two of his sons, Heath and Jarrad, Russell Cunningham and Steve Croft. Six of the finest intrepid travellers that you will find? My vehicle, a GU2 Nissan Patrol accompanied by 2 Nissan Navara’s. All vehicles performed admirably. The area is very dry and apparent barren, but in my view a beautiful, harsh terrain. Virtually treeless, roughly 10m high sand dunes and as you approach Lake Eyre a shimmering stone covered landscape. We wondered why anyone would want to wander out here as the early explorers did. Sitting on a horse looking out at a vast seemingly nothingness looking for the “inland sea” must have been extremely difficult. They certainly had guts, endurance and determination. We drove to within a kilometre from the confluence. By foot, ventured out onto the lake surface. Varying degrees of sponginess underfoot, the further out the softer it got. But we did make it. In Lake Eyre North, about 400 m from the shoreline. This Confluence together with 28S 137 are the lowest Confluences in Australia.